Recently there has been a lot of attention on HIIT, High Intensity Interval Training. Research shows that intense, interval-style workouts improve health and fitness outcomes. HIIT involves brief periods of very hard exercise interspersed with periods of recovery, and it only requires a few minutes a week to be effective. But by its very nature, HIIT is not for everyone. As pointed out in a recent issue of the journal, Frontiers in Psychology, “a largely sedentary population” will probably not “feel physically capable and sufficiently motivated to take up and maintain a regime of highly intense exercise.” For people in middle age and beyond, High Intensity Interval Training may be too challenging. But now, news out of Japan brings a promising alternative. For the past decade, a team of scientists at the Shinshu University Graduate School of Medicine in Matsumoto, Japan has been experimenting with walking programs. 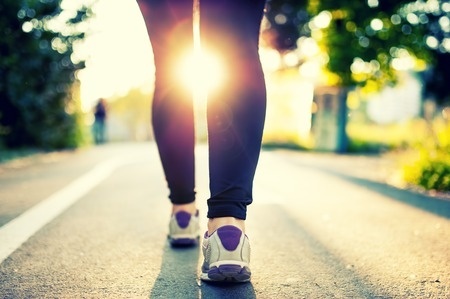 The team, led by Dr. Hiroshi Nose, believed that walking is the easiest and most practical exercise for moderately and minimally active people. They wanted to augment a traditional walking program with intervals of harder work, to achieve greater health benefits. They created a walking regimen that consists of fast walking alternating with gentle strolling. In the Japanese program, participants walked three minutes at an intensity of six or seven on an exertion scale from one to ten. After completing the three minutes of fast walking, participants spent the next three minutes walking slowly. Results of the original experiment were published in 2007. In the trial, one group of walkers between the ages of 44 and 78 years completed five sets of intervals, totaling 30 minutes of walking at least three times each week. A second group of older volunteers walked at a continuous, slower pace of about a four on the same exertion scale. After five months, there was virtually no improvement in the fitness and health of the moderate walkers. In contrast, the interval walkers had significant improvements in their aerobic fitness, leg strength, and blood pressure. Dr. Nose and his team have just reported the results of their latest study, which appeared in the Journal of Applied Physiology. They say most of the participants continued the walking program long after the initial five-month commitment. After a period of two years, nearly 70 percent of the participants still followed the regimen at least three times weekly, and they had retained or actually improved their health gains. The participants who did not continue cited “family, health and job issues,” according to the study’s new lead author, Dr. Shizue Masuki. Rarely, however, did the dropouts say the training had been too complex or difficult.